SECOND half goals from Ian Black, Bilel Mohsni and Dean Shiels gave Rangers their 30th win in League One this season against Forfar Athletic. The Loons are sitting sixth in the table and for long spells they frustrated the champions who struggled to hit top form following two painful cup defeats to Raith Rovers and Dundee United. Ian Black however showed his usual tenacity throughout and with 67 minutes played he showed his quality with a late goal of the season contender. The midfielder received the ball 30 yards out and after looking up quickly he sent a stunning left foot shot into the top corner of the net. There was a sense of relief when that one went in but the Light Blues weren’t finished there. On 74 minutes Mohsni headed home from close range after Dean Shiels’ back post cross had rebounded off the crossbar to the defender. Shiels himself then rounded off the scoring with another fine header after Fraser Aird had put in a great cross from the right. Ally McCoist one change to the team that lost 3-1 in the Scottish Cup to Dundee United with Aird dropping to the bench and Nicky Clark returning to the starting eleven. 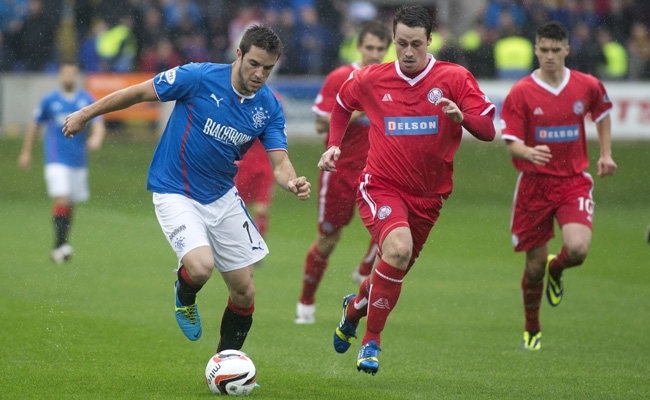 The former Queen of the South striker joined Jon Daly and Shiels in attack as part of a 4-3-3 formation. 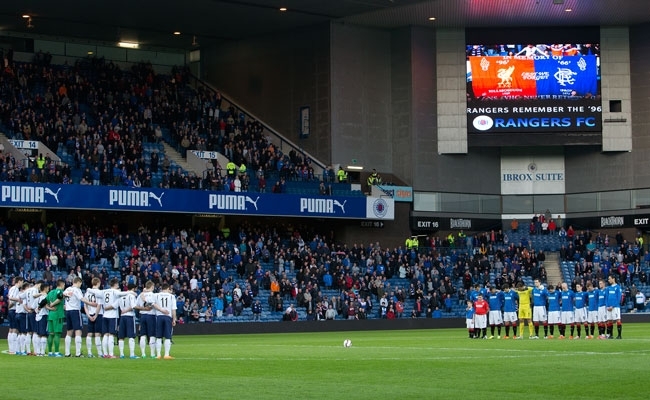 Prior to kick off there was a perfectly observed minute of silence for the 96 Liverpool supporters who lost their lives in the Hillsborough tragedy 25 years ago. And when referee Craig Charleston got the action underway it was Rangers who created the first chance of the match with just three minutes on the clock. Black cut on to his right foot and his dipping shot from 25 yards had to be tipped over the bar by keeper Darren Hill. Arnold Peralta then took the corner and Daly’s glanced header flew across goal and wide of the far post. It was just the start McCoist would have hoped for but after that the game fell flat and it wasn’t until the 27th minute that there was another effort on goal and even then Daly’s shot went well over the cross bar. The first half was to be one to forget for Rangers’ top scorer as he missed a couple of opportunities you would have expected him to score. On the half hour mark Peralta fed the ball through to the powerful striker who did well to find space but his right foot shot from a wide angle failed to hit the target. Four minutes on and when Law played a great through pass to the number nine fans were waiting to see the net ripple. But from 15 yards he curled the ball past Hill and also wide of the keeper’s post. It was proving to be a frustrating opening period for the League One champions and the players looked to have every right to be annoyed a minute before the break. Shiels cut in from the left to get into the 18-yard box but Forfar’s right back Mark Baxter appeared to trip the Ulsterman. Charleston, however, sprinted over and instead of pointing to the spot he pulled out his yellow card, clearly believing the Rangers star had dived. Nicky Law and Lee McCulloch could not believe the decision and as they walked back to the tunnel for the break they took their time so they could have a few words with the official who left the pitch to a chorus of boos. But regardless of that Rangers had to improve dramatically if they were to claim the three points on offer and at the start of the second half there was certainly a bit more urgency in their play. On 51 minutes Stevie Smith tried his luck from another free-kick situation and again his effort had plenty of dip, spin and power but Hill did well to flick it nervously over the bar in front if the Broomloan bears. Richard Foster then delivered a teasing cross from the right but it was inches too high for Daly who stretched his neck but couldn’t get enough purchase on the ball to direct it towards goal. With 23 minutes remaining Rangers were needing one of their big players to step up to the plate and Black did that with a moment of magic. A bouncing ball was squared to the midfielder who unleashed a left foot screamer into the top corner of the net from 30 yards. 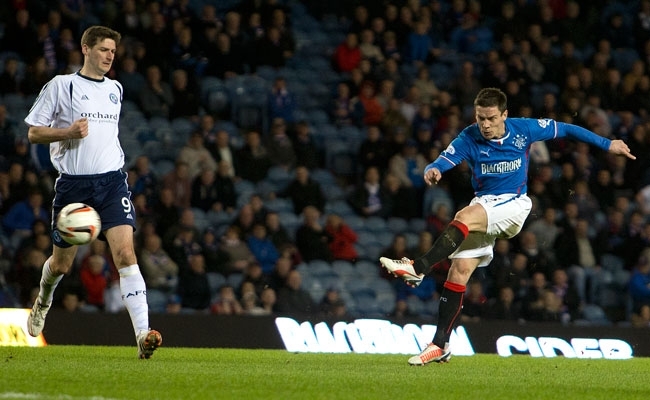 It was a quite sensational strike from the midfielder who was one of Rangers’ better performers on the night. With a goal lead in place the home side started to grow in confidence and on 74 minutes they doubled their advantage. Smith’s wicked cross caused mayhem in the box and when it came out to Shiels his clipped cross to the back post hit off the bar before Mohsni stooped to head it in from five yards. 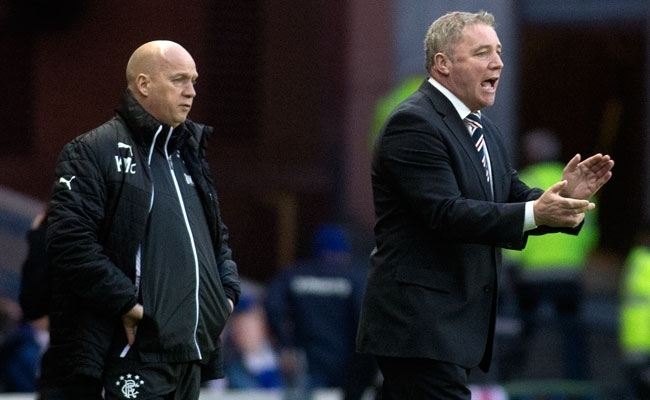 Rangers were now in total control and with six minutes left they bagged a third. Aird’s cross from the right was perfect for Shiels who beat Hill with a great header for his eighth goal of the campaign. Before the final whistle Simonsen made a good stop from Omar Kader before Clark was guilty of missing a snip after he was played in by substitute Fraser Aird. In the end the 3-0 scoreline perhaps flattered the champions as they huffed and puffed in the first hour of this match but they took their chances towards the end and ran out comfortable winners.